Astonishing..... what else may I say? Look at the picture. 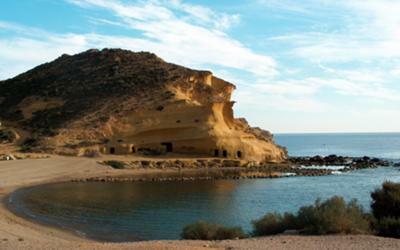 Drive along San Juan de los Terreros, towards Aguilas. Just at the limit between Andalucia and Murcia. And there is a very nice Chringuito as well!! I am so lucky to have this beach, and the adjoining cove so close to my home in San Juan de los Terreros. Sometimes I can go there and I will be the only person. However it is much busier in the Summer. One of the best beaches in the area, in my opinion. We found this fantastic beach purely by accident whilst driving leisurely along the coastal road. You can see the little caves from the road and they enticed us to leave the road and go and explore. The most fantastic find, just magical. You can walk inside the little caves on the beach, and take wonderful photo's from inside looking out into the sea. The beach itself is clean with soft sand, leading into crystal clear water - so clear in fact you can see little fishes swimming around you. Great chiringuitos, easy nearby parking, no crowds, no noise, clean, safe and absolutely fascinating. A must for our next visit. Huh, seems to be an off-the beaten track beach.. I couldn't even find it on my map! So if we should ever find it, we'll definitely write a review. Looks great!